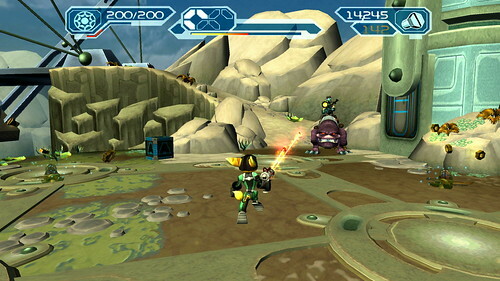 In 2012, PlayStation 3 owners were blessed with the Ratchet & Clank Trilogy for the franchise's 10th anniversary. Now it has been announced that PlayStation Vita owners are in for a similar treat. As announced over at the European PlayStation Blog, the first three games in the long running franchise are making the jump to Sony's handheld. To further spice things up, the trilogy will be available in both digital and physical formats, labeled as Ratchet & Clank HD Trilogy. The bundle will include Ratchet & Clank, Ratchet & Clank: Going Commando, and Ratchet & Clank: Up Your Arsenal. Also included would be the standard features that we've come to expect from these remakes / ports such as improved visuals and textures and also trophy support. No word on Cross-Buy support just yet though, so fingers crossed with that. The news was announced at the European PlayStation Blog so as a result, the bundle is technically only confirmed for those of us residing in said region. It'll be available on July 2nd in Europe and on July 9th for the retail price of €29.99. Those of you in North America shouldn't feel disheartened though as it is likely to arrive there too. What do you guys think about this? Personally I think €29.99 is a bit steep and the drought of 'proper' Vita titles is also a shame. I picked up this collection for the PS3 during a sale for a fiver so I wouldn't mind a Cross-Buy deal and snagging this up for free. I've been an avid Ratchet & Clank fan since the days of my PS2.